Located in Marco Island, this vacation home is a 4-minute drive from Esplanade Shoppes and 5 minutes from Tigertail Beach. With a stay at this villa in Marco Island, you'll be within a 15-minute walk of Marco Island Center for the Arts and Marco Golf and Garden. Free self parking is available onsite. With a stay at this vacation home in Marco Island, you'll be within a 5-minute drive of South Marco Beach and Esplanade Shoppes. Free self parking is available onsite. With a stay at this villa in Marco Island, you'll be just steps from Kice Island and Rookery Bay National Estuarine Research Reserve. Free self parking is available onsite. Located in Marco Island, The Boat House is on the waterfront, a 4-minute drive from Rose Marina and 7 minutes from Marco Players Theater. Free self parking is available onsite. 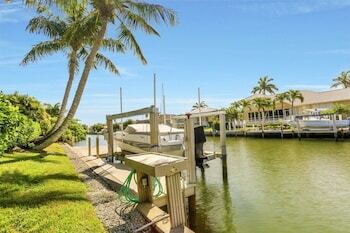 Located in Marco Island, this vacation home is within a 10-minute drive of Marco Island Marina and Marco Island Historical Museum. With a stay at this vacation home in Marco Island, you'll be within a 10-minute walk of Marco Town Center Mall and Marco Players Theater. With a stay at this vacation home in Marco Island, you'll be within a 5-minute drive of Marco Island Historical Museum and Mackle Park. With a stay at this vacation home in Marco Island, you'll be a 2-minute walk from Mackle Park and 6 minutes by foot from Marco Island Historical Museum. With a stay at this vacation home in Marco Island, you'll be within a 10-minute walk of Marco Golf and Garden and Marco Island Center for the Arts. With a stay at this condo in Marco Island, you'll be within a 10-minute walk of South Marco Beach and Kice Island. With a stay at this condo in Naples, you'll be within a 15-minute drive of Barefoot Beach and Vanderbilt Beach. Free self parking is available onsite.